On the hurling scene Shanballymore has a chequered history beginning in 1902 when the senior hurlers contested the county final only to be defeated by Dungourney. In 1942 the junior North Cork and County titles were annexed to be followed by the Intermediate crown in 1943. The 48 and 59 County Intermediate finals were to see a reversal of fortunes as they went under to East Cork Sides, Midleton and Carrigtwohill. 1951 Saw Shanballymore getting revenge on Midleton in another final victory. Shanballymore were back in Senior ranks in 1952 and continued there until 1956 – returning to Intermediate up to 1959. Thereafter the club went into decline and the next taste of success came with the Junior B (or novice as it then was) in 1965. In 1979 the U16 hurlers won divisional and county honours heralding a revival – to be followed in 1981 with the Minor crown – but losing the U21 finals to Ballyhea in 1983 and 1984. The Junior B hurling title was against recaptured at the expense of Ballyhooly. Shanballymore contested the North Cork Junior A hurling final to Clyda Rovers in 1989. This was a great game and a game that got away from Shanballymore. Clyda Rovers emerged that day with a one point victory and went on and won the County Junior A Championship outright. Shanballymore had little success for the next 5 or 6 years before entering the glory years of 96 and 97 as they are known as locally. 1996 was the biggest year the club had in 52 years. We won the Divisional League, the Divisional Championship and the Autumn League. We didn’t loose one single competitive game in that year. 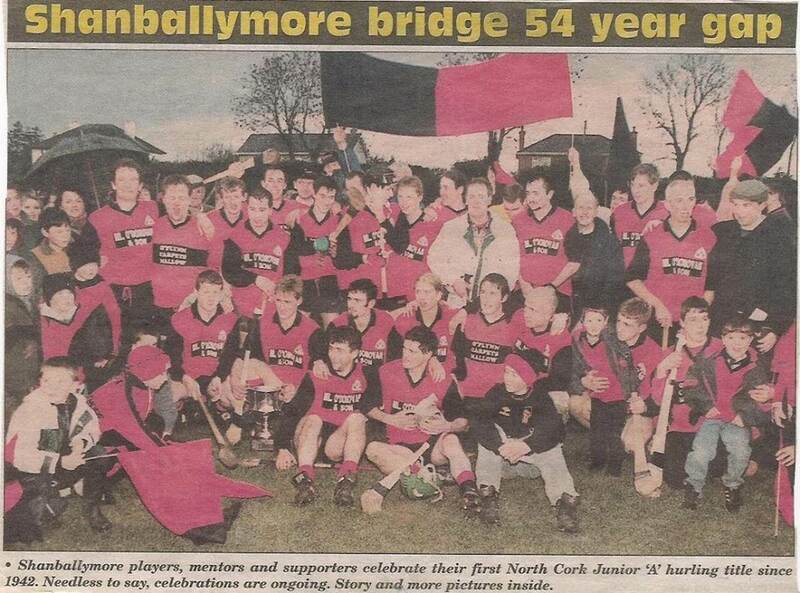 Shanballymore were deprived from going on to contest the County championship in 1996. As the divisional championship was running so late Avondhu were requested for a representative to the county championship. A decision was made to put Fermoy forward who were beaten in the first round of the County and came back and were beaten in their next championship match in the division by Clyda Rovers. Shanballymore beat Dromina in the Avondhu final in Ballyhea in November of this year and added League and Autumn League – What a year!! Also in 1996 two great club men were enhancing the reputations of the club. Connor Hannon Won Senior County medal with Avondhu and was named man of the Match in the final against Imokilly. Tom Mannix lined out at midfield with Clonakilty in the Senior Football decider against U.C.C.